Review copies: Request a review copy. With these 18 beginner-level projects, you can set your Jewish holiday table, bring a personal touch to weddings and bar/bat mitzvah celebrations, and decorate your home with the warmth of Jewish tradition. Sew your own tallit prayer shawl, challah cover, wedding chuppah, and more. A mix of modern projects and classic Judaica reinterpreted for today’s sewing enthusiasts. With 100 illustrations to guide you, a section on basic techniques, and expert tips throughout. Flavored with interesting tidbits about the teachings and history behind classic Judaica and Jewish traditions. If you can set your machine to straight and zigzag stitches, you can make all the projects in this book. • A mix of modern projects and classic Judaica reinterpreted for today’s sewing enthusiasts. • Simple techniques, so even beginning sewists can get beautiful results. • Detailed step-by-step instructions, expert tips, and more than 100 illustrations to guide you. • Interesting background about the teachings and history behind each project. 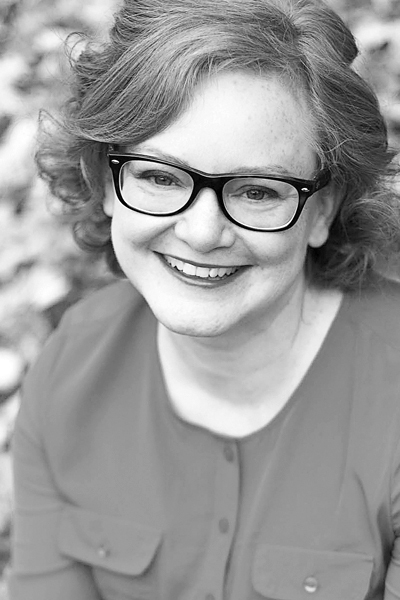 Maria Bywater converted to Judaism in a modern Orthodox community in Washington, D.C. She is the designer behind the leading national wedding chuppah rental company, Huppahs.com. Maria has lived in Tunisia, Kuwait, Libya, and England, and now lives in New York’s Mid-Hudson Valley with her two daughters amid a large extended family. The instructions are easy to follow, and additional information about the history and significance behind each of the items is provided. VERDICT The combination of handcrafting and Jewish tradition adds further value and meaning to these projects, and Bywater’s approach is both thoughtful and celebratory. One of the most exciting new voices in the world of fibrous Judaica design…Clear and beautifully illustrated…I especially like her detailed prayer shawl pattern/instructions, which answers all the questions beginners and beyond have been asking me for years about construction…A must-have for synagogue and Jewish school libraries. 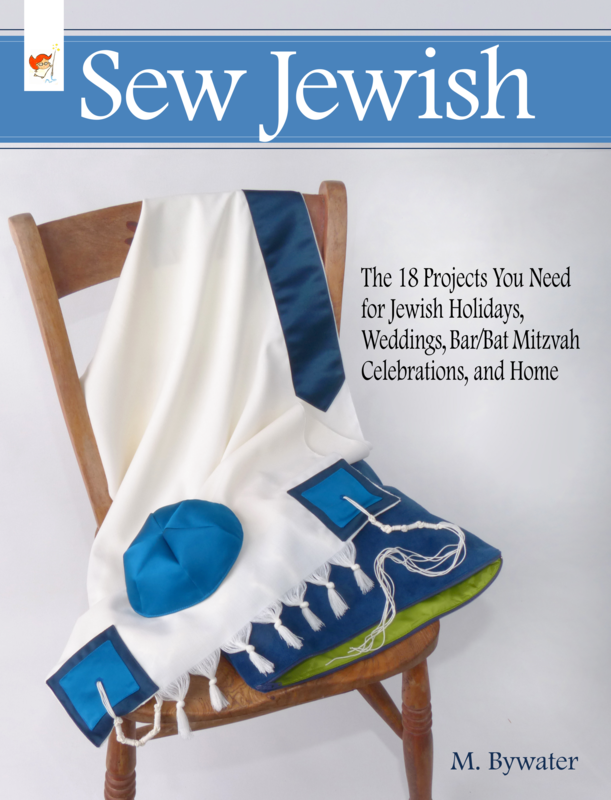 A terrific present for a teen, especially a bar or bat mitzvah who is interested in sewing, for newlyweds, for people who are celebrating conversion, for new retirees, and for anyone who wants to sew and is interested in Jewish heritage and ritual. You can’t help but feel inspired while thumbing through the pages. I saw many projects that I’d like to try; best of all, it’s something I can actually do! Many crafting books that I’ve seen claim to be simple, but are way more complicated than I can manage. (My enthusiasm for crafting greatly exceeds my ability!) Sew Jewish is truly for beginners. The last chapter—which I actually started with—is a treasure trove of practical advice about choosing/cutting fabric, hand and machine sewing, appliques, and markings. I loved that the instructions are clear and concise and each project has large, traceable patterns that make sense and are easy to use. This book has projects than anyone could or would make…There is more than enough information in the book to make it worth your money. It has a great section in the back of techniques. It covers fabric basics, transferring patterns, machine and hand embroidery, as well as machine and hand stitching. Many of the projects can quickly and easily be adapted to many other applications. Feel free to use these images when writing about Sew Jewish. Right click to save the image. Click on these small images to get larger versions.